Although Archimedes was considered as an scientist and engineer, he made mathematical contributions as well. He could give answers to problems with stunning accuracy, while speifying the range(s) the answer could be. This technique is called method of exhaustion. He also applied this method to appoximate the value of pi. He did this by drawing a larger polygon outside of a circle and a smaller polygon inside the circle. When the polygons had 96 sides each, Archimedes calculated the length of the sides and showed that the value of pi lay between 3 1/7 and 3 10/71. He also proved that the area of a circle was equal to pi times radius squared. Archimedes was a successful mathematician and made many contributions for many mathematicians to come. 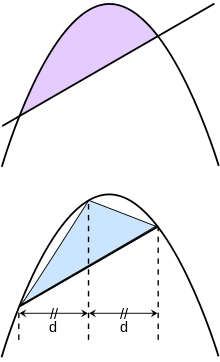 As proven by Archimedes, the area of the parabolic segment in the upper figure is equal to 4/3 of the triangle in the lower figure.